Bolivia’s road toward decolonization is a rocky and contested one. But, as Bolivia’s Vice Minister of Decolonization Félix Cárdenas argues below, in a bleak world full of capitalist tyrants, bloody wars and racist exploitation, the country’s Process of Change under President Evo Morales continues to shine as an alternative to the dominant global order. In 1870, Bolivian dictator Mariano Melgarejo offered an English diplomat a glass of chicha – a corn-based beer consumed for centuries in the Andes. The diplomat refused the drink, asking for chocolate instead. A short-tempered Melgarejo responded by forcing the Englishman to drink a vast quantity of chocolate, and then made him ride a mule, backwards, through La Paz. At least, this is how the story is related by Uruguayan author Eduardo Galeano, who writes, “When Queen Victoria, in London, heard of the incident, she had a map brought to her and pronounced ‘Bolivia doesn’t exist,’ crossing out the country with a chalk ‘X.’” While the story is unlikely true, Galeano suggests it can be read as a metaphor for Bolivia’s tortured history as a victim of colonialism and imperialism. In the interview below, Bolivia’s current Vice Minister of Decolonization, Félix Cárdenas Aguilar, makes a similar point, that “Bolivia is a failed country” because, from the time of its independence in 1825, its modernization was based on the exploitation of indigenous people. The challenge now, Cárdenas explains, is for Bolivia, under the presidency of Evo Morales, to decolonize itself, to reconstruct its past and identity, and to build a “plurinational” country where many indigenous nations can thrive. By resisting subjugation, Bolivia is daring to exist on its own terms. 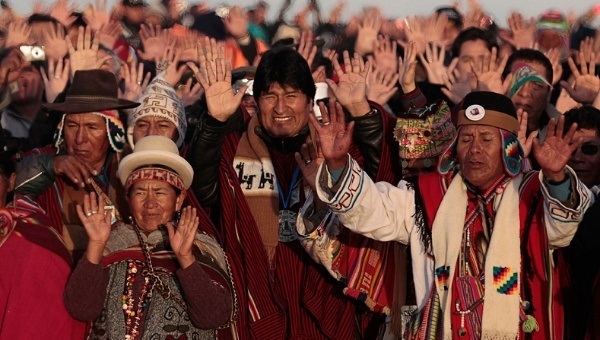 This movement toward decolonization in the Andes is as old as colonialism itself, but the process has taken a novel turn with the administration of Morales, Bolivia’s first indigenous president. Morales, a former coca farmer, union organizer, and leftist congressman, was elected president in 2005, representing a major break from the country’s neoliberal past. Last October, Morales was re-elected to a third term in office with more than 60% of the vote. His popularity is largely due to his Movement Toward Socialism (MAS) party’s success in reducing poverty, empowering marginalized sectors of society, and using funds from state-run industries for hospitals, schools and much-needed public works projects across Bolivia. Aside from socialist and anti-imperialist policies, the MAS’s time in power has been marked by a notable discourse of decolonization. Five hundred years after the European colonization of Latin America, activists and politicians linked to the MAS and representing Bolivia’s indigenous majority have deepened a process of reconstitution of indigenous culture, identity and rights from the halls of government power. Part of this work has been carried forward by the Vice Ministry of Decolonization, which was created in 2009. This Vice Ministry operates under the umbrella of the Ministry of Culture, and coordinates with many other sectors of government to promote, for example, indigenous language education, gender parity in government, historical memory, indigenous forms of justice, anti-racism initiatives, and indigenous autonomy. Before becoming the Vice Minister of Decolonization when the office opened, Félix Cárdenas had worked for decades as an Aymara indigenous leader, union and campesino organizer, leftist politician and activist fighting against dictatorships and neoliberal governments. As a result of this work, he was jailed and tortured on numerous occasions. Cárdenas participated the Constituent Assembly to re-write Bolivia’s constitution, a progressive document which was passed under President Morales’ leadership in 2009. This trajectory has contributed to Cárdenas’ radical political analysis and dedication to what’s called the Proceso de Cambio, or Process of Change, under the Morales government. Such unprecedented work by the MAS hasn’t happened without its shortcomings and contradictions. Violence against women in the country is on the rise, a recent corruption scandal has weakened MAS popularity in current local election races, and extractive industries, while providing funds for the government’s social programs and national development, are displacing indigenous and rural communities, and poisoning land and rivers. Leftist and indigenous opposition to the MAS has also faced government crackdowns, limiting the autonomy and space for grassroots dissent in the country. MAS allies say such pitfalls are part of the societal legacies of colonialism and neoliberalism in the country, challenges which can’t be reversed overnight, but which the MAS is trying to overcome. 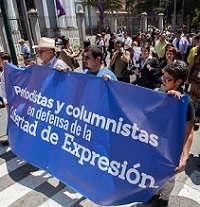 Critics say that the MAS is worsening such problems with sexist rhetoric, a deepening of extractivism, and silencing of critics. 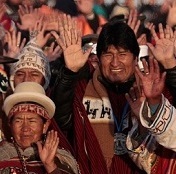 Bolivia’s road toward decolonization is a rocky and contested one. But, as Félix Cárdenas argues below, in a bleak world full of capitalist tyrants, bloody wars and racist exploitation, Bolivia’s Process of Change continues to shine as an alternative to the dominant global order. Benjamin Dangl: Could you please provide an overview of the kind of work the Vice Ministry of Decolonization does? Félix Cárdenas: First of all it’s not the kind of vice ministry where we have to say ‘we built 3,000 kilometers of highway,’ or ‘we constructed 20 stadiums.’ It’s more than anything a political and ideological vice ministry, and for this type of work what we have to do first of all is establish some points of departure for the work of decolonization. It’s not sufficient to go somewhere and say ‘I declare you decolonized!’ and that’s it, they’re decolonized. No. It’s a question of changing mentality, behavior, of life philosophy, and to do this at an individual level, or at a communitarian level, a national level, we have an obligation to first ask ‘what is Bolivia?’ If we don’t clearly understand what Bolivia is, then we don’t know what needs to be done. So, as a part of this process, one has to explain that Bolivia is a failed country. This is a point of departure. Bolivia failed as a proposed country. This country, that was founded in 1825, that claimed to be modern, that claimed to be civilized, that wanted to look like Europe, that wanted to be Europe while denying itself – this type of country failed. It failed because this type of country, that was born in 1825, wanted to be modern, wanted to be civilized based on the destruction of the indigenous people, based on the destruction of their languages, their culture, their identity. Therefore, it’s from this perspective that we understand that Bolivia is not what they tell us – that Bolivia is one nation, one language, one religion. We are 36 [indigenous] nations, 36 cultures, 36 ways of seeing the world, and therefore, 36 ways of providing solutions for the world. We call this diversity of cultures ‘plurinational,’ and we want to build a plurinational state. So, seen in this way, if our future work is to decolonize and create a plurinational society, we have to work in education, we have to work in all areas, in justice, for example, to reinstate indigenous justice. The constitution tells us that indigenous justice and standard justice have the same hierarchy. So there is a need to work in indigenous justice, reinstate indigenous justice in the face of the crisis of standard justice, which is foreign as well as corrupt. The constitution speaks of a secular state. Before, the catholic religion was the official religion. Not today. Today no one is obligated to get married in front of a priest. No one is obligated to be baptized in front of a priest. Religion was the strongest aspect of colonialism. Religion was always power. Today, no. Today religion is outside of power, outside of the government palace. It’s fine if religion dedicates itself to saving souls, but never again will it define the politics of the state as it used to. When many people talk about decolonization they think it’s just an indigenous people’s problem. But decolonization is not an indigenous peoples’ problem, decolonization is everyone’s problem. For example, our bourgeoisie, our private business class, thinks that they are condemned to always live off of the scraps thrown to them by transnational companies. This is colonialism, and they don’t dare invest in the development of their own country. And so, decolonization is everyone’s work. BD: A process of decolonization has to be global, right? What do countries in the north, the most capitalist countries, have to do as a part of this process? FC: For the first time, the countries of the north have to look at themselves in the mirror and realize that they are in crisis. If they don’t accept that they are in crisis, they will never find ways to solve their crisis. But they also need to accept that they’re in crisis and they themselves don’t have the solutions. They have to look to us, to the indigenous people. Not to Bolivia, but to the indigenous people that are all over the world, and who have a philosophy of life that is qualitatively superior to philosophies constructed in the form of civilizing modernity. From Bolivia, we salute the [Syriza] triumph in Greece. We salute the future triumph in Spain, which has more or less the same characteristics. These revolutions in Spain and in Greece are being built while looking to Bolivia. So, for us, this is a kind of complication; to recognize that 500 years ago they [Europeans] arrived, taught us a way of life, a type of religion, a type of modernity that failed. And so today, after 500 years, we, the indigenous people, have the obligation to go to Europe and speak to them, to convert them, to tell them that there is another way to live, and that their crisis is bringing planet earth to a global crisis. BD: The economy of Bolivia is very much based in mining, gas – extractivism. How do you see this process? How can Bolivia overcome its dependency on mining and gas? On the one hand, the president speaks of respecting mother earth, but on the other hand, mining and gas industries are very crucial here. How do you see these contradictions? FC: This isn’t something that this government invented. Bolivia has always lived off of mining, we have always lived off of extractivism. Now, what we hope to do is that this sacrifice, this fruit that mother earth is providing us with, is not in vain. And that it doesn’t just leave [the country] as raw material, but that there’s a need to industrialize, and as we industrialize we can reach the point where we can lower the level of extractivism.